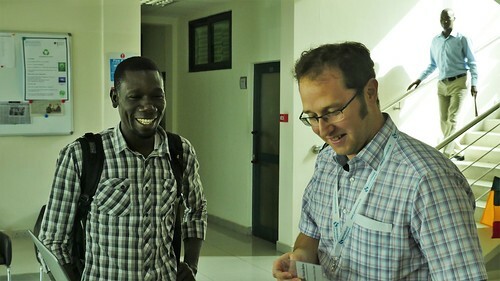 Welcome to PASCAL: Daniel Felten with a participant at the registration desk. In the meantime the number of participants grows constantly. They arrive by taxi, some of them even on foot. In the end there are 24 participants who take a seat in the conference room. The majority of them comes from Ghana (10), followed by Nigeria (5), Benin, Kenya and South Africa (2) and finally Cameroon, Zambia and Senegal (1). The two young scientist from South Africa had the longest trip to Accra, around 4800 kilometres as the crow flies. The participants – among them 7 female scientists – mostly come from universities in their home countries, the lesser part from science centres or laboratories. Their fields of study: Hydrology, Geosciences, Biosciences, Plant Science, Agriculture. Mishek Musokwa from the University of KwaZulu-Natal in South-Africa: One of his research interests is Agroforestry. One example for the latter is Mishek Musokwa from the University of KwaZulu-Natal in South-Africa. 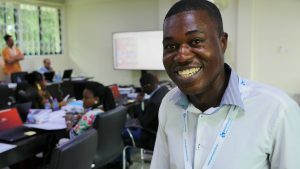 The young researcher works in the field of Agroforestry – a land use management system in which trees or shrubs are grown around or among crops or pastureland. This combination of agriculture and forestry has varied benefits, among them increased biodiversity and reduced erosion. The young man applied for the fall school, because he needs input and new methods to convince farmers that Agroforestry is far better than destroying soils with monocultures like maize. 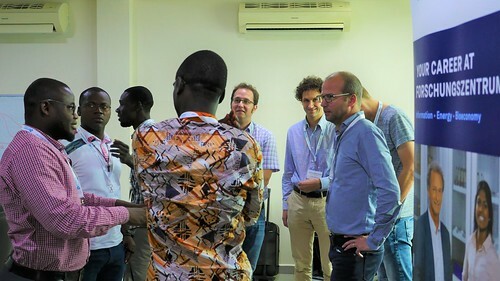 Discussions: The participants have a lot of questions – and show a remarkable state of knowledge.